They love you to death, literally. They're loyal, affectionate and are at the door waiting to welcome you home— no matter what kind of day you've had. Puppies make you feel wanted. They provide consistency. You don't have to demand that they have these qualities because it's just in their DNA. You don't have to teach them how to love you or how to be there for you when you need them. Because you are the world to them they depend on you for food, shelter and companionship. That's a lot of responsibility, but that sense of being needed can be comforting. It allows you to care for something — and it's needs — aside from your own. And you can expect to be tested. Dogs have personalities, too! They might not listen, do what they want to do or piss you off by breaking house rules. But dealing with them appropriately, how you respond to those things, is also a part of taking responsibility. Having a pet can teach you to be patient, mindful and considerate. Those who have pets are more likely to be motivated to exercise. The need to take care of your pup by taking them out for a walk, jog or run encourages you to lead a healthier lifestyle. And even if working out isn't your thing, and you'd rather take your pup to the dog park to play with other pups, that's fine, too. Gain 10 pounds and see if your dog cares. Probably not. A few pounds gained, a few pounds lost, your pup will love you either way. 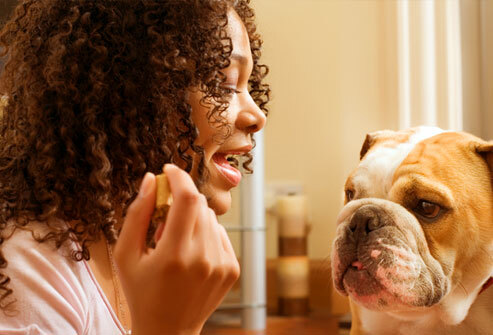 The Centers for Disease Control and Prevention (CDC) and the National Institute of Health (NIH) have both conducted heart-related studies on people who have pets. The findings showed that pet owners exhibit decreased blood pressure and cholesterol levels. They're more likely to be less stressed and easily recover from sickness faster that non-pet owners. Can you say that about any of your exes? When you get to scolding your dog about something they did wrong, he's not going to yell back. He'll just look at you with the "are you finished or are you done" face and walk away. And when you realize you ought to laugh at yourself for yelling at your dog when it wasn't that serious, you'll indirectly learn to control your emotions. Because sometimes we all get all bent out of shape trying to convince others that their actions upset us, only to later come to the conclusion that scolding and yelling resolves nothing and isn't a constructive way to communicate. When you just need someone to be there and listen, no judgement, that's what a puppy can give you. They won't pretend to listen or flat out ignore you. Having a doggie improves your social skills. When you take your dog to the park, to outdoor cafés or with you to run errands, you can be sure you'll be paid a compliment or two. Who knows, a simple compliment could lead you to someone who's datable. Most importantly, getting a puppy and not jumping into a new relationship will keep you from hurting someone else in the process. Great friends make good rebounds, but once that rebound relationship has run its course you've also lost yourself a really close friend. And if they were someone who came into your life and instantaneously became your rebound partner, congratulations! You've probably come to the realization you didn't actually like this person, and instead you we're lonely, comfortable jumping from one emotional attachment to the next. I'm not saying that rebound relationships don't serve a purpose, I'm simply saying there are alternatives to jumping out of one relationship and into another. There are many ways to deal with unloading your emotional baggage that don't include getting other people involved or jeopardizing your integrity.